I took this photo as I entered the cave (sanctuary) at Marble Mountain (Vietnamese: Ngũ Hành Sơn; "Five elements mountains"). I wanted shots without people - this is a popular site just outside the coastal city of DaNang, so that was not an easy thing to accomplish. During the American war I spent 10 months in and around DaNang and had no idea the caves existed - another example of me being clueless about Vietnam when I was 19. Apparently the National Liberation Front (Vietcong) new about the caves and made good use of them. Meeting the "Buddha" as we walked up Yen Tu Mountain - the cradle of Buddhism in Vietnam. We walked through a thick fog on our way to the top of the mountain. My friend Hugh offered "The thick fog might remind us that the path is still there even if it is not fully in view". While resting going up Yen Tu Mountain a pilgrim quietly passed me on the path above - a difficult path for going down the mountain. When the nuns and monks of theThiền Viện Trúc Lâm Trí Đức Monastery sweep the floor you are able to witness a mindful ballet where the two brooms and monastic are one. With this photo I return to a more documentary style of photography - an offering to our mobile sangha from the Sisters of Thiền Viện Trúc Lâm Trí Đức monastery. I often take photos of brooms, but only ones made by hand. I came across this one while walking through a pagoda early one morning. This is one of my favorite brooms - the wall's strong contrast makes it stand out. I'm back in Cincinnati after a three-week trip to Vietnam – and, I'm a little bit behind on my weekly postings. I'll try to make up for it over the next week or so. This photo was taken at the lake in front of Chùa Thầy (Thầy Pagoda). I was drawn to the color of the buildings and the impressionistic reflection in the water. I will be posting more photos from this pagoda as I process more "negatives". I have visited the citadel – sometimes referred to as the Imperial city three times. Each time, I go deeper into the "city" and find more interesting structures. Much work has been done to restore the various gardens and structures – but much more needs to be done. I took this photo earlier today – I had never seen this part of the city before. If time permits, I hope to return to the Citadel one more time before I leave Hue. I'm back in Vietnam – this is my fourth trip back to Vietnam since the end of the American war. Currently, I'm in Hanoi staying with friends – I will be moving on to Saigon tomorrow. This photo was taken at a temple a short distance from where I'm staying. In Hanoi, it seems like there are temples or pagodas every few blocks. It's been raining since I arrived so the flat gray sky is not very interesting – So it goes. In a few weeks, I will return Tu Hieu Pagoda in Hue, Vietnam. The last two times I visited Tu Hieu I was traveling with Thay and the Sangha. Tu Hieu is a beautiful pagoda with gardens and ponds and and buildings that make me feel I'm in a different time. When I was 19 and traveled to Vietnam for the first time, Tu Hieu would have seemed so strange and foreign – very different than the small Northeastern Ohio town I grew up in. It monochrome, this is a timeless photo (if you ignore the digital cameras). Thay's mindful walk from his hermitage to Rising Tide Meditation hall at Magnolia Grove Practice Center. It's a beautiful winter's day in our back yard, but the winter has been hard on many beings. This deer seemed to be on her own. Very little food is available and all of the deer are eating "deer resistant" plants. The forecast is for warmer weather - the snow will melt and hopefully more food will be available. This photo was intentionally over exposed to create a more ethereal environmental portrait. Many of my photos come from my archives. This one does not - it was taken this morning outside the church where Article 25, a newspaper sold on the streets of Cincinnati, is distributed to vendors. Andre Flanagan (on bike) is talking with Greg Flannery before heading out to sell papers. Greg is the editor of Article 25. "Article 25 is a street newspaper based in Cincinnati; street papers are non-profit, grassroots newspapers with a distribution model specifically designed to offer a creative solution to those suffering from unemployment, homelessness, or poverty. Distributors, who are financially struggling, homeless, or formerly homeless individuals or families, go through training and become certified distributors of a street paper. At Article 25, distributors buy the paper at 25 cents per copy – covering productions costs – and then sell the paper for a dollar on the streets and throughout the community of Cincinnati. The 75 cent profit serves as a supplemental income to help people get themselves back on their feet." From Article 25's web site. Looking back, I can see why I enjoyed the walk to Lower Hamlet - walking and breathing taking in the beauty of the morning. Slow mindful walking from Upper Hamlet to Lower Hamlet - the four-fold Sangha flowing like a river. Someplace to go something to do, but no need to hurry. A break from mono images - a chance for me and for those who stop by to see what's new. This space is a good place for me to play and explore. Photos of flowers require a higher standard - you start with something that has such natural beauty - how can photography add to something that is perfect as it is. Perhaps, one answer is the background - the canvas. That's what I've done with this orchid. I'm thankful for greenhouses - you won't find conditions necessary to produce orchids in Ohio in February. Lower Hamlet – Plum Village – In 2012 I spent three weeks in Plum Village. I stayed in Upper Hamlet and whenever Thay gave a talk at lower Hamlet we would walk the country roads to Lower Hamlet. I enjoyed the peaceful morning walk - mostly we walked in silence - walking and breathing in the present moment. It's a beautiful countryside and in the morning the sunlight is perfect for photography. This photo was taken as I approached Lower Hamlet - in the distance you can see the belltower, always a welcoming site. I met this Thai monk while traveling with the greater Plum Village Sangha in Vietnam. This photo was taken at one of the historical sites in Hue. 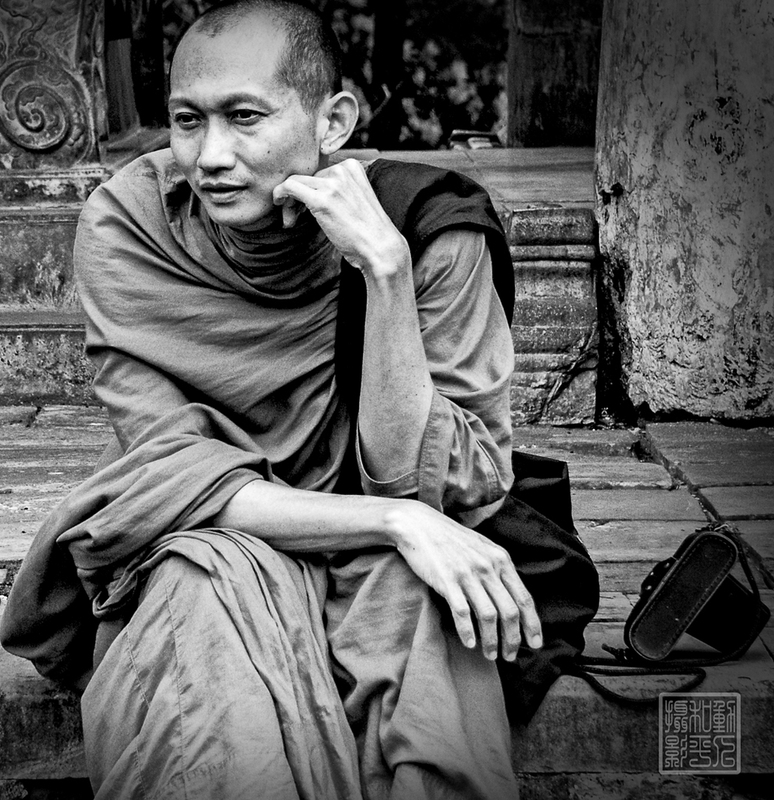 Like most monks in Thailand, he was part of a Theravada tradition. We shared an interest in photography and wondered around taking photos - he was relaxed in front of the camera. He was also "old-school" in his photography, using a film camera. It has been a hard winter in Southwest Ohio – From a photographic point of view, the snow has smoothed out the edges and created a simplified canvas. This not so "goldfinch" was resting, waiting for an opening at the bird-feeder. Even with its desaturated winter color it provided some contrast and beauty on this monochrome January day.